NO ONE. Every SINGLE one of them failed. Even surprisingly each scored a ZERO on a scale of 5. The tests was conducted by London based car-safety watchdog Global NCAP. The cars that was selected for the safety test were hatchbacks; Tata Nano, Maruti Suzuki Alto 800, Hyundai i10, Ford Figo and Volkswagen Polo. The car models chosen for the test had to be the entry level models that are manufactured in India only. Hence none of them had airbags, which is considered one of the most basic requirement by global standards. Two tests were conducted independently on on the same make and model for every brand. One test was made at 56 KMPH and the other one was at 64 KMPH. All the cars were obtained from the Indian showrooms and shipped to Germany where the crash test was performed. The results were shockingly bad. Each scored a zero on a scale of 5. Representatives from each brand were on site to witness the test. As the results were on table, the manufacturers could only come up with excuses stating the complexity in designing the safety of a car. And that it also involves the risk of the person outside the car, so the person at wheel needs to well versed with the traffic rules and the roads should be in the good condition. While the last part, though sounds like a reasonable argument, it bears no connection with the manufacturing process or the design aspect even for a nitwit. In the 64km/h NCAP test, the Tata Nano achieved zero stars rating for its adult occupant protection. The vehicle structure was rated as unstable, increasing the risk of life-threatening injuries and making the car unsuitable for the fitment of airbags. The car achieved a zero-star rating for its child protection as it was not possible to install child seats in the car. The Nano was not able to meet the UN’s minimum safety requirements in the 56km/h crash test. Like Nano, Alto 800 achieve zero stars in adult occupant protection and vehicle structures was rated as unstable. However, using the child seats recommended by Suzuki-Maruti, the Alto 800 achieved a two-star rating for child protection. The Alto 800 was not able to meet the UN’s minimum safety requirements in the 56km/h crash test. 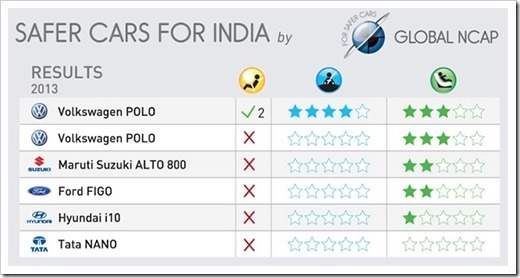 Ford Figo also got zero star rating in the tests however the vehicle structure was rated as stable. Without safety equipment such as airbags, too much of the crash energy was absorbed directly by the occupants. Using the child seats recommended by Ford, the car achieved a two-star rating for its child protection. The silver lining for Figo was that it was able to meet the UN’s minimum safety requirements in the 56km/h crash test as the driver’s head narrowly avoided direct contact with the steering wheel. Like previous cars, Hyundai i10 also got zero stars in adult occupant protection and vehicle structure was also rated as unstable. Using the child seats recommended by Hyundai, the i10 achieved a one-star rating for child protection. The i10 was not able to meet the UN’s minimum safety requirements in the 56km/h crash test. In the crash test, the Volkswagen Polo without airbags achieved a zero-star rating for its adult occupant protection. The vehicle structure was stable, but without safety equipment such as airbags, dummy readings indicated a high risk of life-threatening injuries. All the companies reacted with a resolve to refurbish their brand. To back their point most came up with the fact that they meet the Indian standards, which again shows how medieval our policies are to this day. Although one (Volkswagen), considering this as an embarrassing lesson, have decided to come up with basic prerequisites like dual front airbags for their future models. The growth of Indian middle class has contributed to the booming automobile industry but what seems from these results are that the cars we ride were never meant to keep us SAFE as per global safety benchmarks. Another finding by NDTV also points out that the Euro i10 (made for European markets) have good ratings by the same agency, while the ones Indians drive scored a zero on safety. This raises the question of discrimination, which is also equally if not more disturbing. It intrigues me, if our policy makers will now reconsider or just let the dirty business march on? "Best Selling Indian Cars Taken for Crash Tests And Look Who Passed [Videos]", 5 out of 5 based on 1 ratings. Divide By Zero Brings India’s First Indigenously Built 3D Printer! Twitter Commerce: Where Facebook Failed, Twitter Jumps In! Ratan Tata Reveals The Reason Why Nano Failed! Tata Nano 800cc variant Coming soon: Will it succeed in the Entry-level car segment? Gujarat: Fast becoming The Detroit of India? What all marketers can learn from the Volkswagen!